Crispy outside, soft centers with hints of rosemary, sea salt and pepper make these the best Roasted Rosemary and Olive Oil Potatoes. They are the perfect addition to some scrambled eggs or a great grilled steak with three herbed butter. These Roasted Rosemary and Olive Oil Potatoes are the perfect addition to any meal. Have a wonderful Sunday! First wash and dry the potatoes; then using a sharp knife cube them. You want to make sure the potatoes are about 1/4 x 1/4 inches in size so they cook quickly and evenly. In a large skillet add the oil, salt, pepper, onions, potatoes and half of the rosemary; cover the pan with a lid or some foil paper. I love using my good ol’ cast iron skillet for these roasted rosemary and olive oil potatoes. Cook for about 10 minutes slipping them with a spatula periodically. Once the potatoes are soft remove the lid then brown them to your desired crispiness. *The lid on the potatoes will steam them, so they are soft on the inside. Cook until they are fork tender; then remove the lid and start to brown them. They typically take about 10 minuets to steam with the lid; then an additional 10 minuets to brown. I love mine extra crispy so I let them cook a little longer. Once the potatoes are just about finished; add the remaining fresh chopped rosemary, (lemon thyme and chives if desired). These Roasted Rosemary and Olive Oil Potatoes are the perfect addition to any meal. Crispy outside, soft centers with hints of rosemary, sea salt and pepper make these the best Roasted Rosemary and Olive Oil Potatoes. 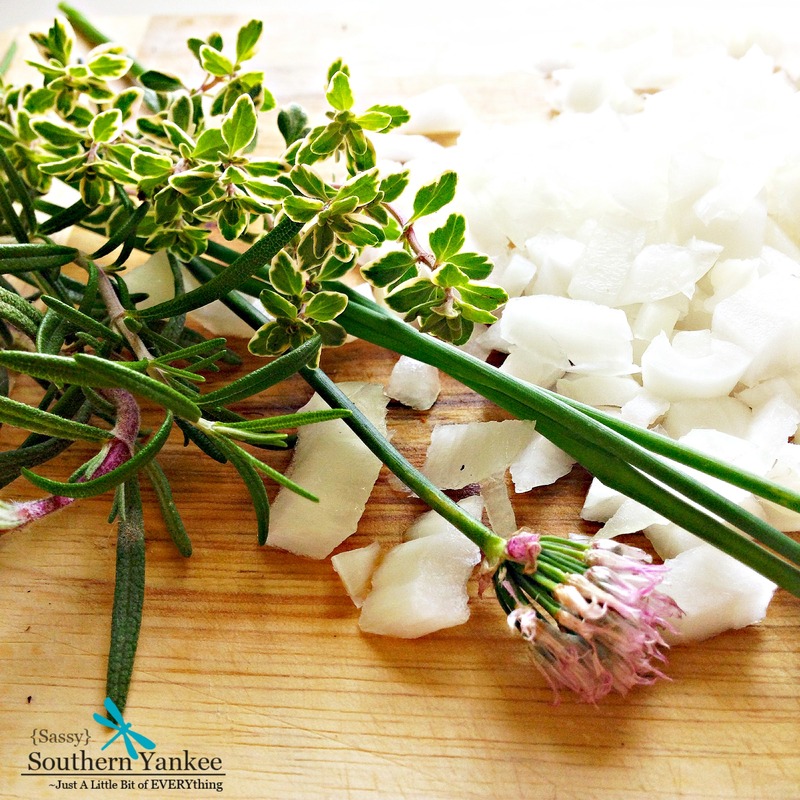 They are the perfect addition to some scrambled eggs or a great grilled steak with three herbed butter. 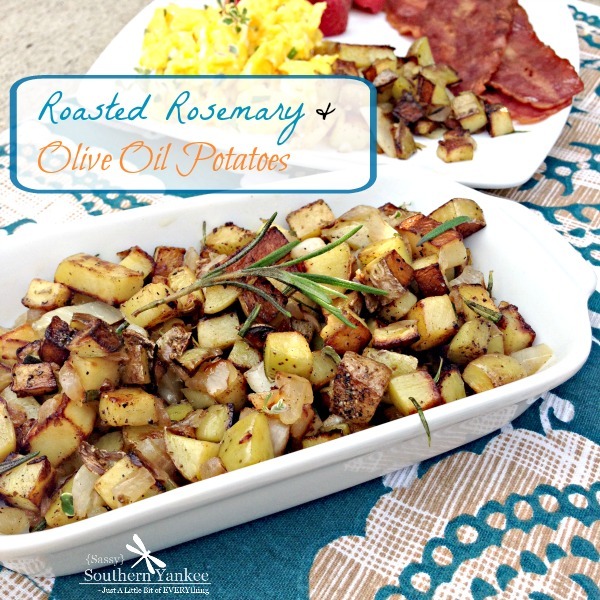 These Roasted Rosemary and Olive Oil Potatoes are the perfect addition to any meal. First wash and dry the potatoes; then using a sharp knife cube them. You want to make sure the potatoes are about ¼ x ¼ inches in size so they cook quickly and evenly. In a large skillet add the oil, salt, pepper, onions, potatoes and half of the rosemary; cover the pan with a lid or some foil paper. 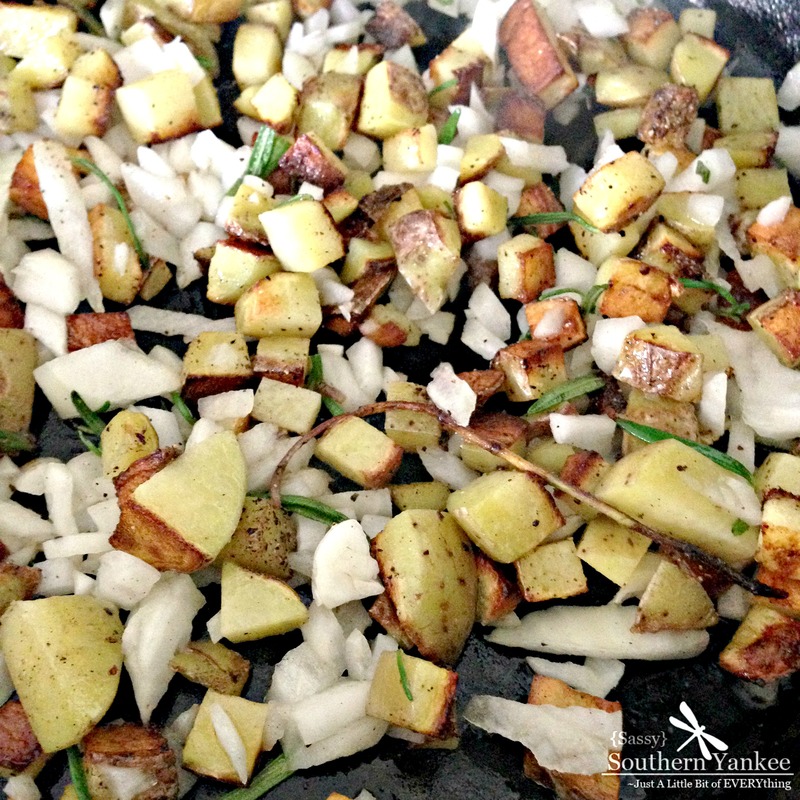 I love using my good ol' cast iron skillet for these roasted rosemary and olive oil potatoes. Cook for about 10 minutes slipping them with a spatula periodically. Once the potatoes are soft remove the lid then brown them to your desired crispiness. Once the potatoes are just about finished; add the remaining fresh chopped rosemary. These Roasted Rosemary and Olive Oil Potatoes are the perfect addition to any meal. 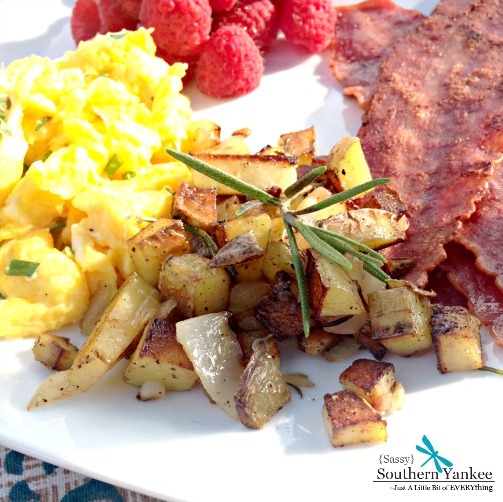 This entry was posted in Breakfast, Side Dish and tagged Breakfast, Brunch, Cast Iron Skillet meals, Fresh From the Garden, Holiday Brunch, olive oil, Potatoes, Rosemary, Side Dish, Skillet, Whole 30, Whole 30 Recipies.